Get started today with our no-risk special! 2 Classes for $19.99, plus a FREE UNIFORM! Start your martial arts journey today! Summit Martial Arts low-cost Introductory Program is the first step in your martial arts education. New Students only, limited openings. Welcome to Award Winning Summit Martial Arts Academy located in Delaware, Ohio for 25 years. The only Gracie/Pedro Sauer Academy in Central Ohio and the only Shorin Ryu Karate Kobudo Federation Academy in Ohio. What this means for you is that you get the highest quality jiu-jitsu, Karate, Self Defense, Fitness and youth / teen program possible. We are committed to teaching the highest quality Jiujitsu, Karate, Kobudo, Yoga, Health & Fitness programs and Self Defense possible. As a complete Health & Self Defense system and not just for tournament, fad or sport. Providing our students with the most practical and effective self defense skills ever created, rooted in rich history and the principles of ethical & moral behavior. A world class facility fully padded, safe, clean, positive and respectful atmosphere. Classes are taught by highly quaified instructors, all Internationally Certified with decades of experience. Summit Martial Arts is veteran owned and has been serving Delaware, Ohio fulltime for over 26 years. Summit Martial Arts Okinawan Shorin Ryu Karate/Kobudo, one of the greatest self defense systems ever created. Summit Martial Arts has programs for beginners to advance students. You will learn the the complete system of Okinawan Shorin Ryu Karate and Kobudo, created by the oldest living people on earth, as the founders wanted it taught in a safe, and cooperative enviroment. You can begin at any time without previous experience. Safety is our number one concern, there is no competitive sparring in beginner programs. We believe in partners, not opponents. Summit Martial Arts Adult Gracie/Pedro Sauer Jiujitsu has programs for beginners to advance students. You will learn the the complete system of Gracie/Pedro Sauer Jiujitsu as Helio Gracie wanted it taught in a fun, safe, and cooperative enviroment. You can begin at any time without previous experience. Safety is our number one concern, there is no competitive sparring in beginner programs. We believe in partners, not opponents. Summit Martial Arts Youth Programs Covers Karate, Jiujitsu and Kobudo, Bully Defense and Stranger Danger. Our goal is to instill in your child unshakable confidence, self disipline, leadership, and real self defense skills. So they can face life's challenges with confidence and detrimination, belts are earned, never purchased here at Summit Martial Arts. Private lessons can be designed for individuals, two people, small groups or large private groups. ​Some folks do privates only, while others combine group classes and a few privates to optimize their results. 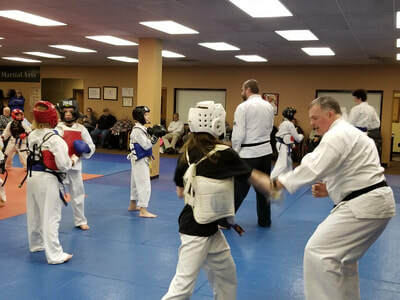 Every month, you can take advantage of the incredible learning opportunities we offer here at Summit Martial Arts in Delaware, Ohio. Our seminars and trips include the best instruction and historical context about the disciplines we teach and the values they represent. Our workshops are normally 2-3 hours, our seminars can range from 3-12 hours and camps are held as multi-day events at the dojo and off-site. We even offer world events held in Brazil, Okinawa, Japan. Also because Summit Martial Arts is connected to world reknown organizations, as a student you can train at other locations and get invited to private seminars. As a Summit Martial Arts student you also get access to our members only currculum; interactive videos, private events, mindfulness training, reading list, black belt and leadership retreats, private lessons with world reknown instructors.